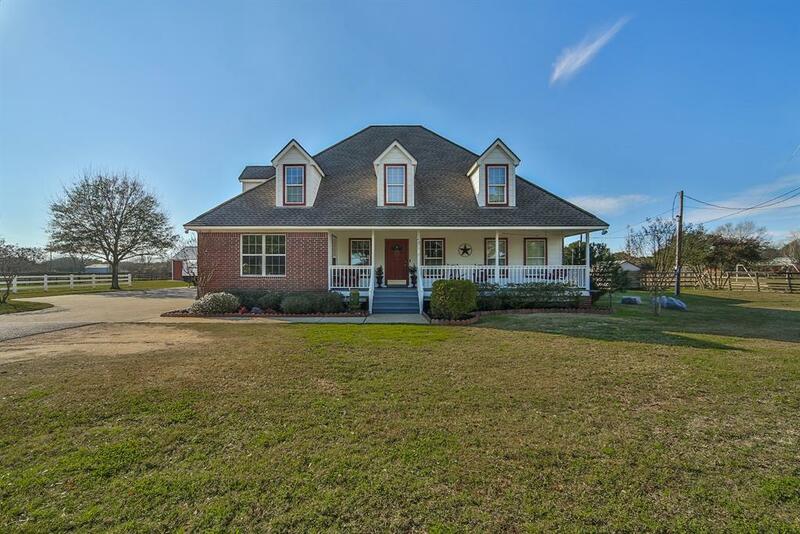 This home on 3 sprawling acres will thrill anyone in search of quiet country living and wide-open spaces while still having city conveniences right at your fingertips. The 3/4-bedroom, 3-bathroom main house comprises a living room, formal dining room, den, and island kitchen with granite countertops, subway tile backsplash, farmhouse sink, double ovens, and an oversized walk-in pantry. Well-suited for a multigenerational household, featuring a mother-in-law suite with 2 bedrooms, 2 bathrooms, and a full kitchen, as well as a 1-bedroom, 1-bathroom apartment with a full kitchen above the garage and a 1-bedroom, 1-bathroom living quarters next to the garage. Property has been fully fenced, has a fully insulated 2-car garage, includes a 1,440 sqft Morton Barn with workshop and boat space, picturesque water garden, an Endless Pool, and graciously proportioned wood deck perfect for outdoor entertaining. You won’t come across a home this unique again. Did not flood.